In this project, we use a large number of neutron scattering methods combined with the state-of-the-art first-principles calculations to characterize, understand, and predict new advanced hydrogen storage materials. Below we briefly describe the neutron scattering and computational methods available at NCNR. The study of hydrogen in materials by neutron scattering methods such as elastic and inelastic scatteing, imaging, and trace-analysis techniques will be a critical component of any research on hydrogen storage materials. For the most part, this is due to the novel properties of the neutron and its interactions with matter, especially the different isotopes of hydrogen. The unusually large neutron scattering cross section for hydrogen can be routinely exploited by a range of experimental neutron methods in order to probe the amount, location, bonding states, and diffusion of hydrogen in any promising hydrogen-storage material. The thermal and cold-neutron beams at NIST combined with state-of-the-art instrumentation d eveloped over the past decade currently provide the nation with its only comprehensive array of world-class neutron probes with respect to sensitivity and dynamic range (see Fig. 1). Due to the large scattering cross section for hydrogen, neutron vibrational spectroscopy preferentially probes the motions of the hydrogen atoms (Fig. 2). Thus, while this technique is roughly equivalent to Raman spectroscopy, the information one obtains is particularly relevant for hydrogen storage. In fact, the filter-analyzer neutron spectrometer at NIST was designed primarily to study hydrogen excitations. Neutron spectroscopy can also be used to quantify the amount of hydrogen in a sample and can tell if the hydrogen is present as H2 by measuring the characteristic rotational spectrum of the hydrogen molecule. This type of data also allows one to obtain information on the interactions responsible for binding the hydrogen in these materials. On the left, we show a typical INS spectrum from sodium-alanate along with the calculated spectrum with one- and two-phonon contributions. Neutron spectroscopic techniques are invaluable for the study of hydrogen diffusion in these materials because of the unique ability of neutrons to simultaneously give information on both the time scale and the atomic scale geometry of the motion. The information provided by quasielastic techniques allows one to develop a detailed understanding of this process required for the atomic scale optimization of these materials. The	figure on the left shows the EISF in super-protonic conductors as a function of temperature. The solid line is a fit to a simple two-inequivalent site model, giving detailed information how protons conducts in these materials. NPD measurements and ab initio Rietveld refinements are invaluable for structure determination. H,Li, which are invisible to X-ray, have large cross sections for neutron scattering. Furthermore, structures obtained from neutron scattering are more accurate as neutrons are scattered directly from nucleus. At NCNR, we have the capabilities to perfrom in-situ powder diffracton measurements as a function of hydrogen loading up to 2-3 kbar pressure from 2 K to 660 K.
PGAA has proven to be useful as an analytical probe of the hydrogen content. Current detection limit of about 1-2 mg H permits measurements of dilute concentrations of hydrogen in a large variety of materials. 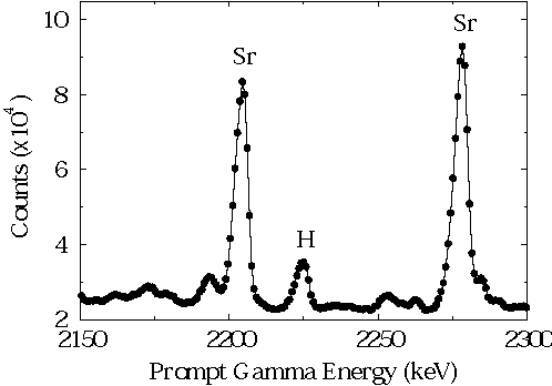 The figure on the left shows a PGGA spectrum for SrZr00.95Y0.05H0.02O2.985 indicating the relative sensitivity to hydrogen prompt gamma ray emission. The ability to predict meterials properties and to design new advanced materials from quantum mechanical principles with computers is currently one of the fastest growing and most exciting areas of the theoretical materials science. At NCNR, we emply a large number of first-princples computational methods to guide and interpret the experimental data. Thanks to available computer resources at NCNR (64 node Beowulf cluster; three 32 nodes shared-memry Origin 3000 supercomputers, etc), we are able to do first-principles computer modeling on realistic materials with very large system sizes in a time comparable to times that experimental measurements take.